Gutes Hostel am Connemara Nationalpark. Große Selbstverpfleger-Küche, nette Mannschaft. Brilliant place to start your Connemara Experience from! We'll definitely come back here again! 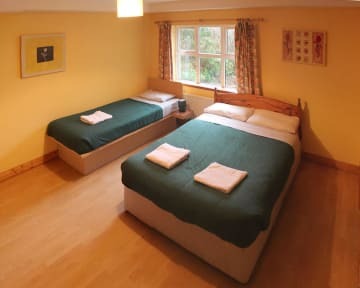 The hostel is perfectly located if you want to spend a nice weekend in Connemara! Pubs are just a footstep away and the nationalpark and the abbey are really close as well. The staff is super nice and the room was really good value! I would definitely stay there again! A cute little hostel with a familiar and welcoming atmosphere. The staff was so nice and our room was more than we expected! It was very cosy and tidy! I recommend this hostel to everybody! Thanks for the nice stay, I'll defenitely be back again! No sugar and pepper in the kitchen which was a bit annoying. Some of the Staff seemed pretty new and a bit helpless when I had a problem that was not my fault. I wished that they were a bit more interested and involved. The more experienced Staff where helpful enough and solved the issue after some time. Also it would be nice to have additional toilets outside the room. Otherwise a really good place to stay that I can thoroughly recommend. Clean bed and towels, great location good shower. The house is really cute and cozy. The kitchen is beautiful and well equiped for a lot of people. It's a 10 minute walk from the lodge to the national park, there is/are a supermarket and two pubs around the corner. We just felt a little uncomfortable because the main door was left open for the whole night. We think that the breakfast wasn't worth 5€, so bring your own food! Es war zwar recht sauber, jedoch gab es etwas Schimmel an den Wänden. Dadurch hat es auch etwas unangenehm gerochen. Ansonsten war aber alles prima! We booked the dormitory for 6 people. Everyone had one key, still the door was always open. After cleaning it was not even closed and everyone could have gone inside. For safety reasons, that room needs an upgrade. Beside that, the stay was nice. A bit moist, due to weather conditions. The Connemara National Park is just around the corner. Die Lage des Hostels ist super und das Personal war auch freundlich, aber leider war die Ausstattung überhaupt nicht zufriedenstellend. Das Bad hatte an der ganzen Decke Schimmel. Ein paar andere Gäste, mit denen ich gesprochen habe, hatten sogar ein Schneckenhaus an der Decke. Das Wasser roch extrem nach Chlor und man hatte das Gefühl, man befindet sich in einem Schwimmbad sobald man den Wasserhahn geöffnet hat. Das Bett war unbequem. Es gab keine Saves oder andere Optionen zum Wegschließen.